In the framework of IEE-ELENA Facility, the European Investment Bank (EIB) has supported the Province of Milan in a 3-years project entitled Energy Efficiency Milan Covenant of Mayors. The investments mainly concern the energy refurbishment of existing public buildings (mostly schools) located in selected small municipalities in the Province of Milan and the Municipality of Milan, all of which have joined the Covenant of Mayors. The obtained funding from ELENA facility is about EUR 1.8 million, corresponding to approx. 90% of assistance costs. The expected investment of EUR 90 million has been articulated in three calls for tender, two of which have been awarded: the first one including 98 buildings in 16 municipalities, the second one addressing 38 buildings in the Municipality of Milan. 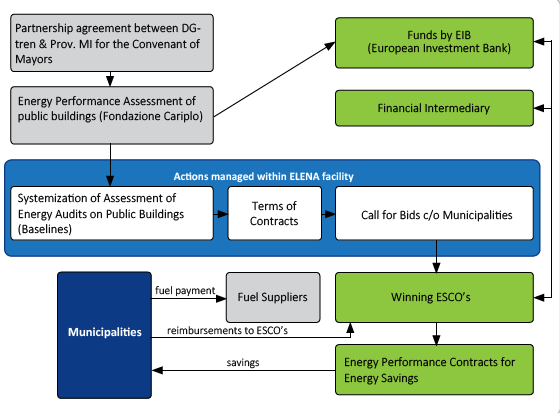 Although facing different difficulties, especially of contractual and financial nature (see below), this project has pushed forward the diffusion and recognition of EPC models in Italy, providing inspiration and support also to other public administrations involved in other ESCO projects (e.g. Provinces of Modena, Padova and Rovigo, Trento). The project aims at the energy requalification of public buildings (mostly schools) in municipalities of the Province of Milan, by insulating the building envelope, fitting the existing thermal and electric plants (including condensing boilers, micro CHP plants, pumps and lights), installing RES and adopting reliable energy management & control systems. Within the first tender, interventions have included: 25 interventions on the building envelope, 31 on the roof insulation, 72 condensing boilers, 17 heat recovery systems, thermostatic valves in 78 buildings, 17 variable-flow circuits, 34 thermal solar systems, 73 micro-CHP plants, 16 heat pumps, 12 radiant systems in gyms, 56 interventions on presence sensors, 81 interventions on thermoregulation with zone valves and tele-control. The investments forseeen amount to EUR 13 million. The minimum energy savings guaranteed to the Municipalities is 35%, while a shared-saving model has been applied (5% of savings guaranteed to the Municipalities). (ii) the resistance of banks, that generally refuse to consider the cash flows generated by energy savings as main collateral. A third tender for the Municipality of Milano was awarded in August 2014, involving 38 schools. The proposed interventions include natural gas conversion of all oil plants, PV installations and a few solar thermal plants, insulation of building fabric and roof, window replacements, interventions on the lighting system and the introduction of BEMS. The guaranteed savings accounted for 35,4% of the baseline, 5% of it directly in the form of shared saving for the municipality. The initial provision approved by EIB consisted in EUR 65 million, while EUR 25 million were expected to be financed via the ESCOs awarding the EPC. The actual total investments amount so far to about EUR 18 million, part of which have benefitted from the credit line provided by EIB. The ELENA assistance activities consists in assessing the final saving requirements, drawing all the tender documentation, organizing and coordinating all the procedures for the award of public work contracts, public supply and public services contracts, then follow and supervise the work and finally monitoring and auditing the results and disseminate the acquired experience.